Click the Menu Item Type Select button File:Help-4x-Menu-Item-Type-Select-Button-en.png and then click the Compact List of Tagged Items Menu Item link under Tags. To edit an existing Compact List of Tags Items Menu Item, click its Title in Menu Manager: Menu Items. Used to create a 'Compact List of Tagged Items' page per tag(s) selected. Tag. Select the tag to use. Content Type. Only tags of the selected types will be displayed (optional). Language Filter. (Use Global (All)/All/Current/English (en-GB)/...). Optionally filter the list of tags based on language. Link. The full URL of the web page address using which includes the http:// prefix. Show Tag Name. (Use Global(Hide)/Hide/Show). For a layout with one tag, show the tag name. Tag Image. (Use Global(Hide)/Hide/Show). For a layout with one tag, show the image for the tag. Tag Description. (Use Global(Hide)/Hide/Show). Show or hide the description for the tag (only used when a single tag is selected). Image. Select or upload the image. Description. The description for the item. Category, Subcategory and Web Link descriptions may be shown on web pages, depending on the parameter settings. These descriptions are entered using the same editor that is used for Articles. Ordering: (default). The column in which to sort displayed items in the table. The values are the same as the column heading names. Direction. Sort order. Descending is highest to lowest. Ascending is lowest to highest. Item Image. (Use Global/Hide/Show). Show the image for each item. Item Description. (Use Global/Hide/Show). Show or hide the description for each item in the list. The length may be limited using the Maximum Character option. Maximum Characters. The maximum number of characters to display from the description in each tag. Filter Field. The Filter Field creates a text field where a user can enter a field to be used to filter the articles shown in the list. 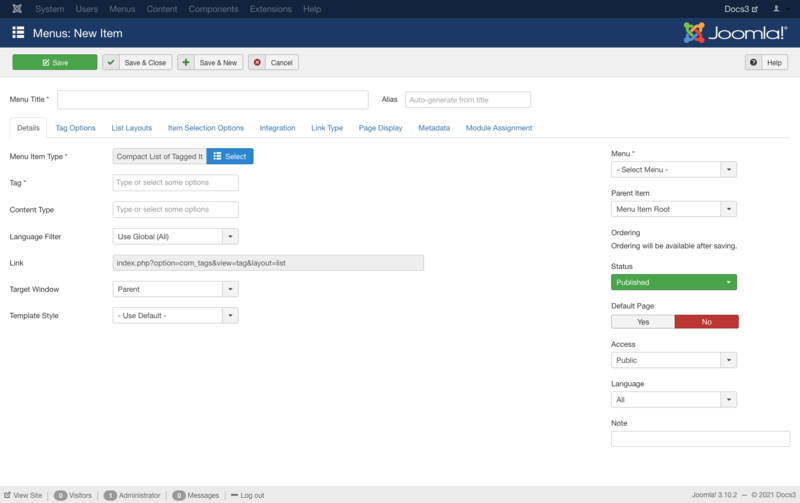 An example of how this looks in the front-end layout is shown below. The possible options for this (in the back-end menu item edit) are shown below. 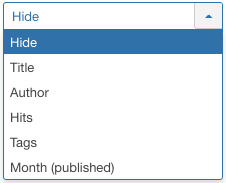 Use Global: Use the value from Article Manager→Options. Only appears in Menu Item Type Options. Hide: Don't show a filter field. Title: Filter on article title. Author: Filter on the author's name. Hits: Filter on the number of article hits. # Items to List. (Use Global, 5, 10, 15...) Default number of tagged items to list on a page. Show Date. This option allows you to show a date in the list. The options are as follows. Use Global: Use the value set in Article Manager→Options. Hide: Don't show any date. Created: Show the created date. Modified: Show the date of the last modification. Created: Show the start publishing date. Date Format. Optional format string to control the format of the date (if shown). If left blank, the date will use the DATE_FORMAT_LC1 format from the language file (for example, "D M Y" for "31 December 2012" or "m-d-y" for "12-31-12"). See PHP Date Documentation for more information. Match Type. (Use Global (Any), All, Any) All will return items that have all of the tags. Any will return items that have at least one of the tags. Child Tags. 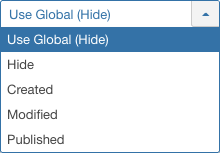 (Use Global (Exclude), Exclude, Include) Include or exclude child tags from the result list for a tag. Menus Menu Item Tags Items List Used to create a 'Tagged List of Items' page per tag(s) selected. Menus Menu Item Tags Items List All Used to create a 'List of All Tags' page per tag(s) selected. This page was last modified on 7 September 2018, at 22:08.